This new guide is an excellent resource for anyone honing their identification skills for this often confusing group of birds. The descriptive text is well-written and informative. Range maps for each species are included, including migration patterns of most species. The images are only average, many are dark and some lack defined detail. The text describes differences between similar species but I would like to have seen more comparison images. With more than 50 gull species in the world, this family of seabirds poses some of the greatest field identification challenges of any bird group: age-related plumage changes, extensive variations within species, frequent hybridization, and complex distribution. Gulls of the World takes on these challenges and is the first book to provide a comprehensive look at these birds. Concise text emphasizes field identification, with in-depth discussion of variations as well as coverage of habitat, status, and distribution. Abundant photographs highlight identification criteria and, crucially, factor in age and subspecific field separation. Informative species accounts are accompanied by detailed color range maps. 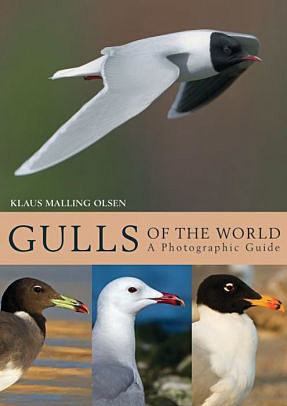 Klaus Malling Olsen is widely regarded as the world’s foremost gull expert. His previous books include Terns of Europe and North America and Gulls of North America, Europe, and Asia (both Princeton). The book is in hardback. List price is $45.00, available for about $35.00 in various locations.